Besides earning a reputation as "the shoe museum"—with its current The Rise of Sneaker Culture show and recent Killer Heels exhibition—the Brooklyn Museum is also forging a path in showcasing exciting young artists such as its current show of work by the collective FAILE, as well as its recent overview of Kehinde Wiley, among others. In FAILE: Savage/Sacred Young Minds (through October 4), the team takes what could be perceived as cliché emblems of youth culture—arcade games, day-glo colors, muscle cars, skateboards—and combines them deftly in room installations, sculptural environments, and satisfying paintings. The team's work became prominent when a major pastel-hued installation was installed in the Koch Theater mezzanine as part of New York City Ballet's art initiative in 2013. In an eerily similar vein as Wiley's recent saint-like portraits and stained glass windows, FAILE occupies the Brooklyn Museum's rotunda with a chapel-like, decaying edifice sheltering contemporary prayer wheels and a statuary. It's clearly an effective way to acknowledge the past on new terms. 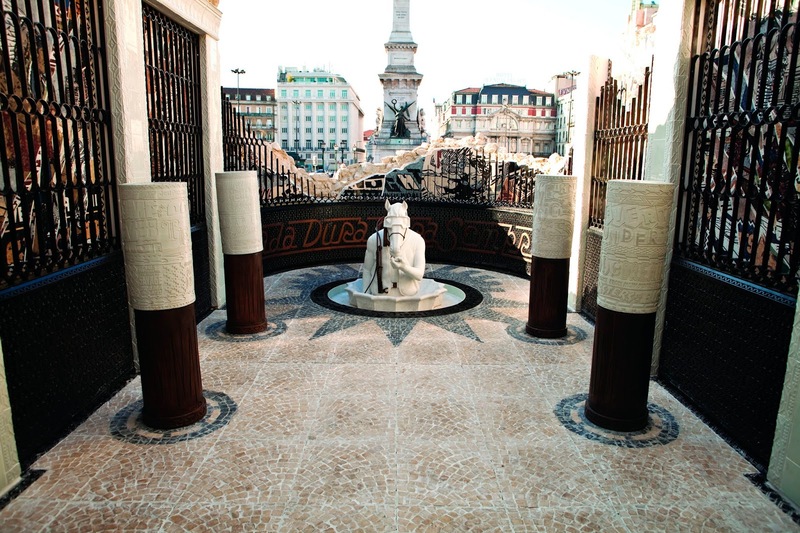 FAILE's Temple installed in Lisbon. If for nothing else (although that's not the case here) FAILE deserves credit for the sheer volume of subject matter they've either quoted from or created to collage together as the collective of mass neon wallpaper, as well as in the paintings on view. All told, it's a restless graphic tableau of ideas, trends, patterns, and harmonic palettes. If the day-glo arcade, with pinball machines, video games, and foosball tables, becomes too claustrophobic or teen-boy for you, move on to the next room, with its soothing classically-derived sculpture. Take a look at the wall of paintings, with their trompe l'oeuil torn away strips, and layered memories of Americana. And even if the artists obsessively brand everything with the collective's name, like an adolescent's notebook doodles, the serious ways in which it's done have impact—in wrought iron gates, mosaics, tucked away in paintings, or blaring in propaganda style, wall-to-wall posters. No doubt The Rise of Sneaker Culture (also through Oct 4) will garner more attention and young visitors, but I have to confess indifference for the genre. Maybe it's because it's primarily a male pursuit whose main publicity engine is the NBA. (There are several "altars" to Nike's Air Jordan line amid the many giant-sized samples.) Or maybe it's because touring the show feels somewhat like shopping. However, amid the mall store style exhibition design, there are cases with examples of early women's shoes. Certain late-20th century models ring bells, such as a relative of my first Adidas sneakers (cheerleading shoes!) and the ubiquitous puffy Reeboks for aerobics. Although where were the canvas Tretorns that were the standard wear for at least a decade? But the majority trace the arc of men's sneakers as individual NBA players—mainly Michael Jordan—had shoes and entire lines custom-designed. Bling and decorative elements were added to others, and technology was applied, such as sole cushioning (even retro technology, like the recent rise of knits in sneakers). There is also the implication of the rise of hip-hop culture's importance in society, with sneakers as the most elemental statement. After seeing the BMA show, try hopping on the subway and strolling down Brooklyn's Fulton Mall to get a similar broad survey of the latest footwear. Just make sure you look at feet on the street in addition to Jimmy Jazz and the numerous other footwear purveyors to take in the full context of fashion. One final observation on an artist whose influence was felt in both the FAILE and sneaker exhibitions: Roy Lichtenstein, whose primary colors outlined with black can be seen in a pair of Nikes, and the general style of FAILE's paintings, which quote pop culture and cartoon techniques. He might be proud to see the extended reach of his high-low work.